LOS ANGELES — After playing six difficult matches to start the year, the U.S. women’s national team got a breather Sunday night. They rolled over Belgium, 6-0, at Banc of California Stadium while connecting for the first four goals in the opening 33 minutes of the international friendly. The U.S. scored five goals off headers. 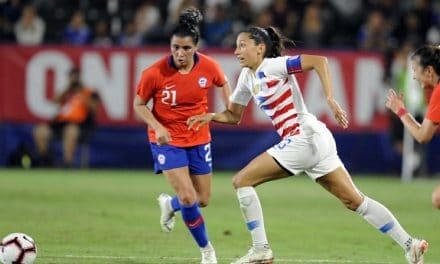 Carli Lloyd, who wore the captain’s armband at kickoff, led the onslaught with two goals as head coach Jill Ellis raised some eyebrows by switching around several positions, notably around the backline. Ellis returned central midfielder Julie Ertz to her role as a center back alongside Becky Sauerbrunn and started Ali Krieger at right back. She also pushed Rockville Centre, N.Y. native Crystal Dunn, who has played at left back during the warm-up matches, up into an attacking midfield position. It worked to perfection, although you have to realize Belgium wasn’t necessarily world class. 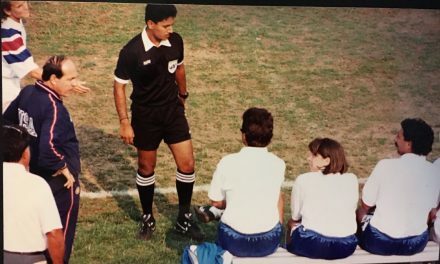 In fact, the Belgians have never participated in a Women’s World Cup. Lloyd started the scoring by nodding home a shot in the 14th minute from nine yards, one bounce into the corner. Five minutes later, Dunn set up the Delran, N.J. native’s second goal, off a left-wing cross by Dunn, who had raced to the goal line. Lloyd deposited the goal into the upper right corner from six yards for her 107th international goal in 271 matches. 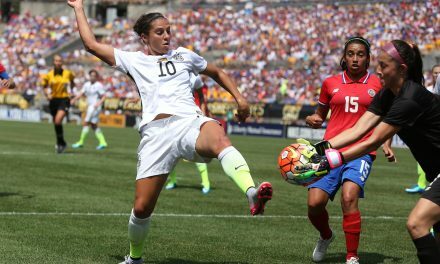 She last scored in a Women’s World Cup qualifying victory over Panama Oct. 7. Lindsey Horan got into the act in the 26th minute, heading home a Christen Press corner kick for a 3-0 advantage before Sam Mewis used her noggin in the 33rd minute from seven yards for a 4-0 halftime lead. 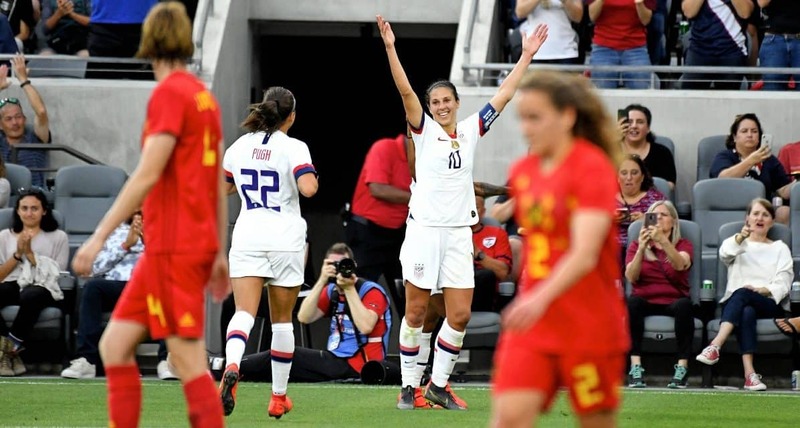 Seven minutes into the second half, striker Alex Morgan broke the streak of headed goals by latching onto a Lloyd pass on the left side and streaking through the defense before firing from six yards for a five-goal margin. A minute into secnd-half extratime, substitute Jessica McDonald, off Press’ third assist of the night, headed the fifth goal into the net just before the final whistle. 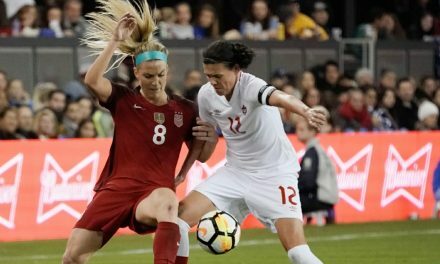 The American players will return to their respective clubs, mostly in the National Women’s Soccer League, before being called into training camp later this spring. The U.S. have three games remaining before they depart for France in a Send-Off Series. They meet South Africa in Santa Clara, Calif. May 12, face New Zealand in St. Louis May 16 and host Mexico at Red Bull Arena in Harrison, N.J. May 26. NYCFC INJURY REPORT: Castellanos is questionable for D.C.